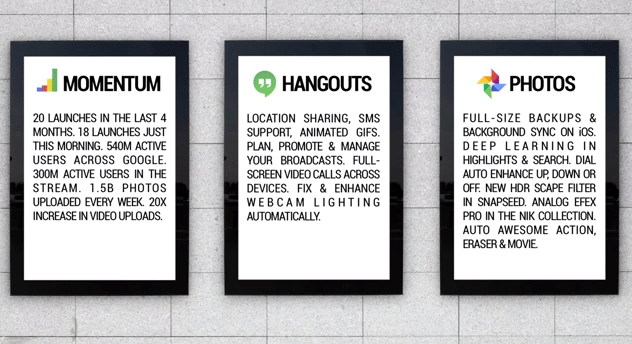 The Google Hangout App now supports location sharing, animated GIFs and SMS support. For “On Air,” Google updates include a dedicated landing page that you can use to promote your event ahead of time (finally) and more options for managing the participants in your Hangout in what they call the Control Room. Be on the lookout for a few new effects, too (black-and-white, spotlight and focus). Google says we need a new way to organize, save and edit our photos. Most of the editing tools that are available take time, money and, well, hands-on learning leaving a lot of people giving up altogether. In real estate, there are plenty of hurdles that make your listing’s story suffer. The Google Plus updates aim to just make it happen automatically and most of the time with the click of a button. By default, photos will now be uploaded at full resolution. In the past, you were able to back up your photos only when you had the Google Plus app open. Soon, you’ll be able to do full-size backups and background syncs on your iOS device (Android users have already had this feature available to them). With a collage of 600 pictures on the screen behind him, Gundotra discusses another algorithm that is behind the “Highlight” and “Search” features of the new Google Plus. The algorithm will be able to pick out your best pictures and hide away any blurry, duplicates, bad exposures, etc. The algorithm also boosts the photos that have the people you love in them (creepy, I know). Searching within your photos also got more impressive. Google added 1,000 more search terms so you’re able to pull up a picture of your own dog just by typing “dog” into search. Search has also been expanded to your circles. If you have the rights and the correct privacy settings are in place, you’ll be able to search your close circles pictures as well. A cringe-worthy moment was the mention of auto-enhance and some higher-end features that are all dependent of how much time you have to invest in your photos. 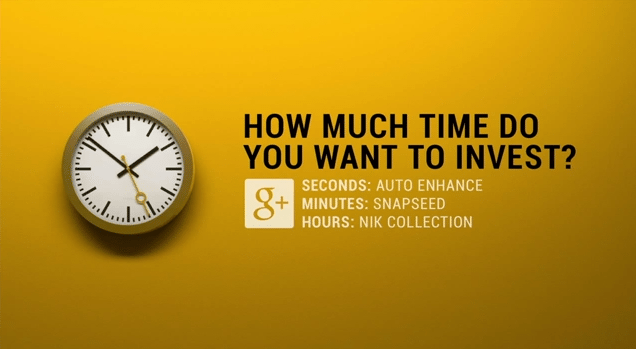 Broken down into seconds, minutes and hours, each category features an appropriate option. Auto-enhance now gives you more control with two adjustment options. The new low and high settings can be controlled on an album-to-album basis. The option to turn off or on still exists. Snapseed is an editing tool that’s available for iPhone and Android users. Google Plus announced a new filter called HDR Scape that allows you to shoot multiple exposures even if you don’t have a tripod and are on a mobile device. What’s perfect for real estate is the filter strength. With the click of a button you can control the strength of this filter — it really only works for landscape and structures vs. portraits. I started the video right where Google shows the HDR Scape. Amazing stuff! On Google’s high end sits Nik Collection. Watch the new Analog Efex Pro demonstration here — I promise it’ll wow you. If you happen to be one who already has purchased Nik, you’ll get this update for free. As a graphic designer, I was trained to cringe when the word auto is attached to things. The last of the Google Plus updates will amaze you, though. 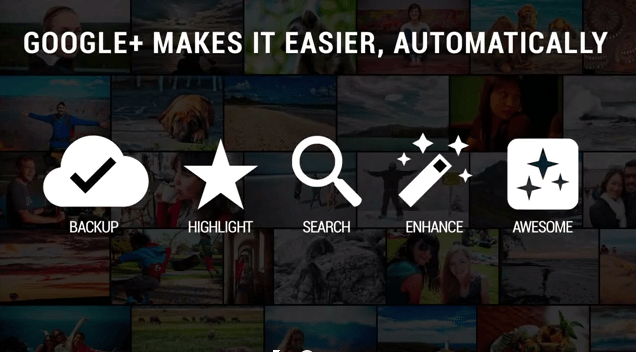 Google says that Auto Awesome is all about stories. Google gets friendly and mentions the word “gifted” a lot when it comes to the new features like animated GIFs and the latest update of Auto Awesome Action. You’ll also see Auto Awesome Eraser, but please make sure as real estate professionals that you check with your local MLS about editing/removing things from your listing photos — right, Leslie? I’ll leave you with the last few minutes of Google’s presentation. Gundotra mentions in Google Plus’s two years they have seen an increase by 20 times in video uploads. Twenty! Gundotra says, “Let me blow your mind for a minute.” He’s not kidding. Would love to hear what you think about Auto Awesome Movie. As amazing as these new features are, Google Plus is making sure everyone knows that they are just getting started. You can watch the entirety of the Google Plus announcements on their YouTube channel. What do you think? As a real estate agent do you think these Google Plus updates will help inspire and guide you to better photos and videos?